The Dual Gas power station (also referred to as the Dual Gas Demonstration Project) is a proposed brown coal and gas-fired power station for construction on land adjoining the existing Energy Brix power station in Victoria, Australia. 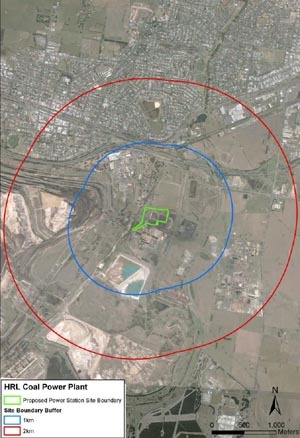 The map below shows Morwell, the proposed location for the power station. The project proponent is Dual Gas Pty Ltd, a special purpose subsidiary of HRL. An application for construction approval for the plant was accepted by the Environment Protection Authority (EPA) Victoria in May 2011. On its website, the EPA states that over 4000 submissions were received on HRL's application with a majority opposing the project. Public comment on HRL's application closed on October 6. The EPA was scheduled to make a decision on the application by January 2, 2011. However, the agency's assessment of the project was suspended after further information was sought from the company. In May 2011 four major banks in Australia denied funding for the coal plant, raising doubts about its viability. The denial came weeks after the plant was initially approved by the Victorian Environment Protection Authority. The EPA's decision would allow the first coal plant to be built in Victoria in nearly 20 years. In late July 2012 the Federal Minister for Resources and Energy, Martin Ferguson, announced that, after four extensions granted to HRL to comply with conditions of a $100 million funding agreement, the government had decided to withdraw funding as the company "did not meet the required conditions set out in the funding deed." The decision was welcomed by environmentalists. Environment Victoria Campaigns Director Mark Wakeham stated that "this is likely to be the final nail in the coffin for the HRL proposal, and for all new coal-fired power stations across Australia." Greenpeace Australia Climate and Energy Campaigner, Julien Vincent, stated that “this result is a great reward for the years of hard work by environment organisations, grass roots groups and the broader community to resist this dirty project.” Following the federal government decision the Victorian Minister for Energy, Michael O'Brien said that while $20 million of the Victorian government's $50 million pledge had been spent, the federal decision "has serious consequences for the separate Victorian funding agreement ... The state government must ensure that Victorian taxpayer funds are protected." A 2016 report on HRL Holdings reports that "In FY15 $44m of the integrated drying gasification combine cycle (IDGCC) technology costs were impaired as there were no longer any foreseeable prospects to realise the technology." Although still listed by the government in 2015 as one if its Major Electricity Projects, the Dual Gas power station project appears to have been cancelled. In July 2002, the then Minister for Energy and Resources, Candy Broad, announced that the government had awarded exploration tenders for brown coal deposits in the Latrobe Valley, one of which was to HRL. In her media release Broad stated that "the Bracks Government is using the coal tender to encourage industry to adopt new, clean technologies to ensure brown coal remains a viable energy source for Victoria in the future." On July 1, 2008 the Victorian Government announced that it had signed a contract with HRL approving the development of a new $750 million 400 megawatt coal fired power station. In the media release announcing the deal, the Energy and Resources Minister Peter Batchelor stated that the project "is expected to be operational by 2012/13" and the Chinese power station construction firm Harbin Power Engineering Company would construct the plant. In the media release, Batchelor claimed that the plant would use "integrated drying gasification combined cycle (IDGCC) which can reduce emissions of CO2 from brown coal-fired power generation by 30 per cent and reduce water consumption by 50 per cent, compared to current best practice for brown coal power generation in the Latrobe Valley." The Victorian government announced that they would contribute $50 million from the Energy Technology Innovation Strategy (ETIS) and that on the basis of that the project would receive $100 million from the Australian government's Low Emissions Technology Demonstration Fund (LETDF). (It was reported that HRL had sought $148 million from the federal government.) However, in May 2008 Batchelor told a Public Accounts and Estimates Committee hearing on the state budget that the funding was an offer conditional on HRL and its joint venture partner succeeding in getting "the rest of the scheme adequately funded." He also explained that "we are not handing over money until they have reached that phase. Then they would need to go through approvals processes in the local environment, and they would need to meet those," he said. Batchelor told the committee that HRL "have indicated to us that they have, through their Chinese partner, Harbin Power Equipment, the likelihood of being able to attract Chinese investment in this." Batchelor also proclaimed, that aside from the increased domestic electricity supply, the project "also offers the opportunity of being able to take that technology into the Chinese and other markets through the partnership with Harbin Power." In announcing federal funding for the project, the Department of Resources, Energy and Tourism stated that "the technology has been proven at the 10 MW scale" and that the project is "aimed at demonstrating the technology at full scale." It stated that the project, which would be based on two 200 MW gasifiers, would be "suitable for carbon capture, with prospects for CO2 removal prior to combustion." It also stated that the "implementation phase of the project is expected to commence in mid-2007, the demonstration is expected to be completed by the end of 2009." In a promotional brochure on the project, HRL's Manager Business Development, Alf Ottrey, stated that "the ETIS funding grant as a component of the overall project financing has assisted us to structure the investment in this ‘first of a kind’ project in a way which is attractive to investors." At the time it was announced that the proposed project would be manufactured in Harbin, China and then exported to Victoria. An adviser to the project, Paul Glasson, argued that the project "would enable China to develop its high-moisture coal reserves in a comparatively environmentally friendly way ... It would offer similar options for the Latrobe Valley's coal fields, and it would almost certainly lead to the export of this Australian-owned gasification technology to China." Despite the company's high hopes for the project, little happened on the ground. In 2009, Harbin decided that it would withdraw from its 50% stake in the project. From the outset the proposal has encountered strong opposition from environmental groups. When the project was first announced in July 2008 as a 400 megawatt plant, Environment Victoria estimated that it would emit an extra 2.5 million tonnes of carbon dioxide into the atmosphere each year. HRL's hype that the proposed power station was a "clean coal" project spurred a complaint from the Australian Climate Justice Program which argued that the use of the term constituted a breach of the Trade Practices Act provisions against false, misleading and deceptive conduct. While the Australian Competition and Consumer Commission found that the company's use of the term was not in breach of the legislation, the complaint had an impact. In September 2009, HRL announced its proposal to establish the power station, not as a clean coal project but as a "dual gas" project. The power station, the company claimed, "will generate up to 550 megawatts of power using syngas (synthetic gas from the drying and gasification of brown coal) and natural gas (as a start up and supplementary fuel)." HRL Managing Director Gordon Carter stated in a media release that "the demonstration project has been designed to also enable the potential retrofit of CO2 capture technology when commercially viable." However, Carbon Capture and Storage is unlikely to be commercially viable within the foreseeable future, if ever. In a presentation at a workshop on best practice for brown coal power, Terry Johnson from HRL Developments explained that the "additional cost is high ~45% increase" in capital expenditure and that the technology would, due to its energy demands, reduce the plant output by approximately 10%. In its media release the company claimed that "the CO2 emissions intensity of the demonstration project is expected to average 0.78 tonnes CO2 per megawatt hour over the life of the project. This is about 40% lower than the current Latrobe Valley brown coal fired power generation annual average CO2 emissions intensity of about 1.3 tonnes CO2 per megawatt hour." The company also stated that the project would "demonstrate the integrated drying gasification combined cycle (IDGCC) technology at commercial scale" and that the company aimed to commence construction in 2010 "pending approvals." The company stated that "an announcement of the successful engineering, procurement and construction (EPC) contractor is expected in early 2010" and that it planned on the plant being "operational and generating electricity in 2013." On September 8, 2010, China Daily reported that China National Electric Equipment Corporation had signed an Engineering Procurement Construction contract with HRL "for a 600MW power plant". At the time of the announcement, the Energy and Resources Minister Peter Batchelor backed the project arguing that "we can’t turn coal off overnight. If we are serious about reducing emissions from energy generation, the solution needs to be a combination of developing new renewable energy sources and by making our traditional energy sources, such as coal, cleaner, through projects such as this." The project also drew support from the Nationals Member for Gippsland Darren Chester. According to a HRL consultant, the proposed plant could be supplied with coal either from the Morwell Open Cut or the Yallourn North Extension mine. The proposed power station was caught under one of the Ministerial Guidelines triggers for the Environment Effects Act which stated that for projects with "potential greenhouse gas emissions exceeding 200,000 tonnes of carbon dioxide equivalent per annum, directly attributable to the operation of the facility" an Environmental Effects Statement should be produced. However, a determination on whether or not to exempt the project from the legislation was sought from the Minister for Planning. In late November 2009 the Planning Minister, Justin Madden, announced that the proposed power station would be exempted from having to prepare and Environmental Effects Statement under the Environment Effects Act 1978. In a statement of reasons on the "550 megawatt" power station proposal of October 2, 2009, Madden stated that no environmental effect statement was required as the construction of the power station "would not have significant adverse effect on environmental values" as it would be build on an "existing industrial site with no significant landscape, waterway, biodiversity or cultural heritage features." Further, Madden claimed that "potential environmental effects of operating the power station, including opportunities to minimise greenhouse gas emissions, resources use, waste ... can be adequately assessed under the Environment Protection Act 1970. Best practice approaches will need to be applied in addressing those aspects." In his statement of reasons, Madden hyped the benefits of Dual Gas's proposed technology. "The proposed technology for power generation using a combination of gasified brown coal and natural gas, if commercially viable, is likely to significantly reduce the greenhouse gas intensity of power generation, as well as water use, relative to brown coal-based power technologies currently in use in the Latrobe Valley. The proposed technology will also facilitate the implementation of pre-combustion capture or carbon dioxide when infrastructure for its transport and storage is commercially available." Madden did not announce his decision, unlike decisions to fast track other development proposals, with a media release. In early August 2010 the Victorian Environmental Protection Agency (EPA) released HRL's application for a works approval permit for the station and invited the public to make submissions within 21 days. The public comment was slated to end on August 25. The EPA also announced that only one public consultation meeting would be held, in Traralgon in the Latrobe Valley but none in Melbourne. The EPA also announced that members of the public could post comments to an online forum run for the agency by Bang the Table. The week before the Victorian government had released its Climate Change White Paper, Taking Action for Victoria's Future. In a forward to the White Paper, the Victorian Premier, John Brumby, stated that the government would "set Victoria a target to reduce emissions by at least 20% by 2020 compared to 2000 levels (equivalent to 40% per capita)." Amongst other commitments, Brumby wrote that the government would "commit to reducing the greenhouse gas emissions of Victorian brown coal-fired generators by up to four million tonnes over the next four years, culminating in a total saving of 28 million tonnes by 2020, equivalent to the closure of two units of Hazelwood Power Station". Under the banner of "Moving towards a cleaner energy future" the white paper stated, the government would "ensure no new brown coal power based on conventional technologies". The White Paper stated that "the Victorian Government commits to no new approvals being granted for new coal fired power stations based on conventional brown coal technologies. Through the Climate Change Bill we will set a target emission level of 0.8 tonnes of C02 equivalent (per MWh) for new power stations – bettering the performance of black coal stations and broadly comparable to the performance of open cycle gas. This measure will provide greater certainty for investors in new, low emissions power stations." Environment Victoria criticised the contradiction between the government's commitment to cutting the state's greenhouse gas emissions and its willingness to entertain new brown coal fired power stations. Environment Victoria’s Campaigns Director Mark Wakeham noted that in the company's application it stated that the plant would increase the state's greenhouse emissions by up to 4 million tonnes per year "yet as the Premier said last week the 20% target requires that we reduce emissions by 30 million tonnes by 2020. It will be impossible to meet Premier Brumby’s target if we build new coal-fired power stations. The emissions reductions from Premier Brumby’s proposal to close one quarter of Hazelwood could be completely cancelled out by this new coal-fired power station." "It would be completely hypocritical for the State Government to retire 400 MW of coal-fired power generation at Hazelwood, only to approve a new 600 MW coal-fired power station with the same level of total emissions," Wakeham said. Shortly afterwards HRL announced that it had withdrawn its original application in order to reconfigure the project to meet the new target emissions level of 0.8 tonnes of carbon dioxide equivalent per megawatt hour as set out in the Victorian government's Climate Change White Paper. HRL spokesperson Maria Brejcha said that increasing the amount of natural gas and reducing the brown coal derived gas percentage of the fuel was an option. In its revised application, HRL Dual Gas stated that the proposed plant would "generate approximately 600MW" of power "for sale in the National Electricity Market by 2013", that the average greenhouse gas emissions intensity of the plant "is expected to be in the ).73 to 0.78 tonnes" cO2equivalent per megawatt hour "over the life of the project" and that it would be built to enable "potential retro-fitting of pre-combustion CO2 capture technology (when commercially viable)". The company stated that annual greenhouse gas emissions were "expected to range from 3.0 million tonnes to approximately 3.2 million tonnes", consume up to 2 gigalitres of water a year. It also noted that the largest emissions are likely to be from oxides of nitrogen and sulphur dioxide. However, it sought to justify the additional air pollution load on the ground that "SO2 and NOx emissions are significantly lower than those from existing Latrobe Valley brown coal-fired power stations due to a lower rate of coal usage." In its submission to the EPA, Environment Victoria opposed approval for the project. It argued that "because the proposed emissions intensity standard has not been enshrined in a SEPP, there is no agreed definition for the 0.8 tonnes of CO2‐e/MWh standard." In particular, it noted that in its first application, HRL Dual Gas stated that "the Greenhouse Gas emissions Intensity (GGI) of the DGDP is expected to lie within the range 0.46 to 0.89 CO2‐e per MWh (of electrical energy sent out) over the life of the project." ('Sent out' power is the amount actually dispatched to the grid. The emissions intensity of 'sent out' power would include all the emissions incurred such as those from from the coal drying and power generation processes and any on-site transmission losses.) However, in its revised application, HRL Dual Gas stated that "the GHG emissions intensity of the DGDP is expected to range between approximately 0.73– 0.78 tonne CO2‐e/MWh over the life of the project. This is ('as generated' data)." However, the federal government's Technical Guidelines: Generator Efficiency Standards adopted the 'sent out' benchmark. In its submission, Environment Victoria noted that "what appears to be an accounting trick by the proponent does nothing to reduce the actual emissions of the HRL Dual Gas project to the atmosphere. Surely in regulating pollution, EPA must assess applications for works approvals on the basis of the absolute pollution from the proposed works, not just the pollution associated with part of a production cycle." The group also argued that the proposed project did not meet internal 'best practice' in terms of emissions standards and was inconsistent with the Climate Change Act which had been ratified by the Victorian Parliament in early September 2010. After receiving over 4000 submissions, the EPA's Gippsland regional manager Elizabeth Radcliffe acknowledged that the number of submissions "is the largest number of submissions EPA has received for an application" of any sort. In response the EPA announced that it had decided to organise a conference "chaired by independent facilitator Bruce Turner" on the proposed power station. However, once again it was in Traralgon. During a federal Senate Economics Committee meeting on February 23 2011, Geoff Stone of the Department of Resources Energy and Tourism, the agency which administers the Low Emissions Technology Demonstration Fund, revealed that the latest project cost estimate has risen from the original $750 million to $1.1 billion. In response to questions from Australian Greens Senator Christine Milne, Stone stated that the deed of agreement between HRL and the Commonwealth was "commercial-in-confidence" and that, while there are preconditions which need to be met before the promised $100 million can be paid to the company, the timetable was flexible. Stone told the Senate committee that the company had requested and been granted extensions to the deadline to meet conditions on "at least three and potentially four" occasions. Ms Margaret Sewell, the head of the Clean Energy Division in the department and the CEO of the Australian Centre for Renewable Energy told the committee that "the project proponents still have to reach financial close before any of the Australian government’s funding will be realised. If the rules under which this power station is built were to change, then they would have to deal with that. We will not sign the deed and make the commitment of the money unless they have reached closure, and they will have to deal with carbon pricing, emissions standards—whatever the environmental controls of the day are. That is just part of the project. In May 2011 the Victorian Environment Protection Authority announced that it had approved one 300MW generating unit of the two the company had proposed. Instead of assessing the project against 'best practice' standards for generating electricity, the EPA assessed the project "against best practice for brown coal fired power generation". In a media release announcing the decision, released on Friday May 20, the EPA stated that "the demonstration project is best practice for this type of brown coal technology and will produce electricity with around a 30 per cent improvement on current greenhouse gas emissions from coal fired power stations. This is a significantly better environmental outcome than other plants currently producing electricity from brown coal in Victoria." EPA CEO John Merritt stated in a media release that the second proposed 300MW generating unit would be "reviewed when the proponent was able to demonstrate the successful operation of the first phase of the demonstration project." He also stated that the approval for the first unit was "conditional on HRL Dual Gas Pty Ltd submitting details on how it will meet all conditions prior to construction, including additional measures to reduce sulphur dioxide emissions." In an interview Merritt argued that "we were clear that our interpretation of the Act and our application of the best-practice standard was to compare this technology against alternative brown coal technologies and power generation." Asked why the proposed power station wasn't compared against alternative energy sources, Merritt suggested the agency was constrained by its own legislation. "Look it's important for environmental regulators everywhere to work within the legislation that they have," he said. In a media release Environment Victoria CEO Kelly O’Shanassy stated that "there is no way the HRL Dual Gas project can be considered to be best practice electricity generation given that it is twice as polluting as an efficient gas power station and many times more polluting that renewable energy or energy efficiency projects." "Even with this part-approval the new plant will pump millions of tonnes of pollution into our environment every year. How is this protecting the environment or Victorians?" she said. Environmental groups -- including Environment Victoria, Greenpeace and Stop HRL -- organised a protest against the EPA's decision on the steps of State Parliament on May 24. The snap rally attracted 300 people. "We're going to tell investors, super funds, bank, joint venture partners, whoever it may be, that this is a project, that if they get associated with, there's going to be a massive community campaign all over them," Julian Vincent from Greenpeace said. Environment Victoria's Campaign Manager, Mark Wakeham told the crowd that "we cannot tackle climate change if we are building new coal-fired power stations." Following the EPA's conditional approval for the project both Environment Victoria and HRL flagged that they were considering possible legal challenges. Environment Victoria's subsequent legal challenge centred on the EPA's decision to assess best practice energy production based on a benchmark of a brown coal-fired power station rather than including alternative energy sources. For its part, HRL appealed against the EPA's decision to approve one 300MW unit and not both. In a statement, reported in the Australian Financial Review but not available on the company's website, stated that "Dual Gas has some significant concerns with the EPA Victoria-configured 300MW alternative." (AAP reported that "HRL management would not speak to the media, but issued a written statement...". The following month HRL announced that it was putting work on the project on hold until the federal government had made a decision. The general manager of Dual Gas, Paul Welfare, said the tribunal judgment "effectively put the future of the project in the hands of the Australian government". In June 2012 the Minister for Resources. Martin Ferguson announced that the deadline for concluding an agreement under the contract for closure program had been deferred. In a media statement Ferguson stated that "there are a number of complex commercial issues yet to be resolved including the need to ensure value for money." Ferguson stated that "negotiations are expected to continue and the Government will endeavour to reach an outcome in the coming months." Even though HRL have conditional approval for the project, financing the project remains its Achilles heel. The Age reported that all four main Australian banks -- ANZ, Westpac, the Commonwealth and National Australia Bank -- have stated that they are not involved in the project. Westpac spokeswoman Jane Counsel stated that "we will continue to consider financing coal projects in the future, but our focus is very much on supporting those projects that use cleaner and more efficient technologies and are making the transition to a carbon-constrained operating environment." The Age also reported that federal government correspondence obtained under the Freedom of Information Act revealed that in 2006 government officials believed that a plant smaller than 400MW would not be cost-effective. "HRL does not believe it can reduce the physical size of the plant," the advice says. The Age reported that the Minister for Energy, Michael O'Brien "said the EPA decision meant Victoria could continue to use its vast brown coal reserves at a significantly lower level of emissions. But he added: 'The future of this project … is, of course, a commercial decision for HRL.'" However, after the EPA decision the Australian Financial Review revealed that prior to the Victorian state election in November 2010 HRL had sought almost $600 million in public subsidies to make the project viable. Matthew Dunkley reported that a brief prepared for the new government in October 2010 stated that the cost of the proposed plant had increased from $750 million to $1.3 billion and that the company was facing a "significant financial shortfall" largely because of the collapse of the federal government's Carbon Pollution Reduction Scheme. The briefing discussed the pitch by HRL to the Brumby government that it buy the plants electricity output at a cost of approximately $384 million via a 15 year power purchase agreement. The briefing stated that HRL was "requesting that government essentially underwrite the revenue risk for 15 years". In return the company proposed that the dividends from the project, worth about $180 million, would be passed on to the government. If a carbon price was introduced the company argued the state government's contribution would fall. The former Minister for Energy, Peter Batchelor, wanted an in-principle agreement before the election was called but the government did not support his view. The brief also reported that HRL had also sought an additional $200 million from the federal government. However, the company had been told this was unlikely. The briefing argued against providing further support stating that it would undermine possible investment in other gas-fired generation. The Baillieu government's Minister for Energy, Michael O'Brien stated that the company had not raised the idea of a power purchase agreement with the Coalition. Following the decision Environment Victoria pointed out that the new Bailleau government's policy made it easier to get approval for a brown coal-fired power station than for a wind farm. Prior to the election the Liberal Party campaigned on a policy of restoring "fairness and certainty to the planning system for wind farms" by instituting a number of new measures including ensuring that "the placement of turbines will be no less than two kilometres from the nearest home unless a contract between the resident and wind farm developer is agreed, giving residents a veto over the construction of a wind farm within two kilometres of their house. However, approximately 250 homes would be within two kilometres of the proposed Dual Gas power station. (See here for a higher resolution version of the map). "It obviously sends the wrong signal when we are trying to clean up the energy supply and reduce greenhouse gas emissions," said Environment Victoria campaigns director Mark Wakeham. A resident within the two kilometre range told Age reporter Adam Morton that her asthma had got worse since moving to the Latrobe Valley. "It seems to me that the coal plants they are building are coming closer and closer to the township of Morwell, and that will mean that residents will have to move further out from the town to get away from them," she said. ↑ 1.0 1.1 1.2 1.3 1.4 1.5 HRL, "HRL propose $750m dual gas power plant for Victoria", Media Release, September 24, 2009. ↑ Environment Protection Authority Victoria "Dual Gas Pty Ltd – dual gas demonstration power station, Morwell", Environment Protection Authority website, October 22, 2010. ↑ 3.0 3.1 Environment Victoria, "New coal-fired power station faces massive public opposition", Media Release, October 6, 2010. ↑ Stuart Fletcher, "EPA halts power plant assessment", ABC News, January 7, 2011. ↑ 5.0 5.1 5.2 5.3 5.4 5.5 Royce Millar & Adam Morton, "Big banks 'no' to coal plant", The Age, May 21, 2011. ↑ "Green Technologies Flow From Brown Coal Tenders", Media Release, July 17, 2002. ↑ Energy and Resources Minister Peter Batchelor, "New $750 Million Clean Coal Power Station a Step Closer", Media Release, July 1, 2008. ↑ 15.0 15.1 Public Accounts and Estimates Committee, Public Accounts and Estimates Committee Inquiry into budget estimates 2008–09", May 22, 2008. ↑ Department of Resources, Energy and Tourism, "Low Emissions Technology Demonstration Fund (LETDF) Round 1", Department of Resources, Energy and Tourism, July 2008. ↑ Rowan Callick, "Rudd meets Chinese energy chiefs", The Australian, April 09, 2008. ↑ 19.0 19.1 Adam Morton, "Watchdog clears 'clean coal' tag", The Age, September 25, 2008. ↑ Environment Victoria, "New coal-fired power station makes a mockery of State Government's climate credentials", Media Release, July 2, 2008. ↑ Adam Morton, "Green for go with brown-coal station", The Age, April 14, 2010. ↑ Terry Johnson, HRL Developments Pty Ltd, "Gasification Technology for Brown Coal Power Generation", APP Brown Coal Best Practice Workshop, Melbourne, June, 2008. ↑ "Power firm bags Australian deal", China Daily, September 9, 2010. ↑ "$750m gas fired power station steps forward", Media Release, September 25, 2009. ↑ Alex Blatchford, "Summary document describing: IDGCC process description, calculation of greenhouse emissions and best practice", HRL, September 26, 2011, page 14. ↑ Dual Gas Pty Ltd, "Dual Gas Demonstration Project", page 27. ↑ 27.0 27.1 Justin Madden, Minister for Planning, under Environment Effects Act 1978, November 23, 2009. ↑ Justin Madden, Minister for Planning: Releases for November 2009", website of the Premier of Victoria, accessed October 2010. ↑ Power Plant Application up for assessment", Media Release, August 4, 2010. ↑ John Brumby, "Message from the Premier", Taking Action for Victoria's Future, July 2010. ↑ Government of Victoria, Action 2 - Moving towards a cleaner energy future", Taking Action for Victoria’s Future website, July 2010. ↑ Environment Victoria, "New coal power station decision to test Brumby’s climate credentials", Media Release, August 4, 2010. ↑ Environment Victoria, "State Government should rule out new coal-fired power station", Media Release, September 14, 2010. ↑ Stephanie Charalambous, "Dual gas power plant delayed", Latrobe Valley Express, August 9, 2010. ↑ Dual Gas, "Dual Gas Demonstration Plant:EPA Works Approval Application Summary", September 1, 2010. ↑ Environment Victoria, "Environment Victoria submission on HRL Dual Gas Works", October 6, 2010, page 4. ↑ Environment Protection Agency, "Public conference for Dual Gas Proposal", Media Release, October 12, 2010. ↑ 40.0 40.1 Environment Protection Authority, EPA Grants Part Approval for HRL Demonstration Project", Media Release, May 20, 2011. ↑ 41.0 41.1 Mary Gearin, "Outcry over new coal-fired plant in Victoria", PM, ABC radio National, May 20, 2011. ↑ 42.0 42.1 "Victorian Environment Protection Authority approves big pollution hike", Environment Victoria, May 20, 2011. ↑ Environment Victoria, Urgent Snap Rally: No New coal for Victoria", Environment Victoria website, May 20, 2011. ↑ "Stop HRL: Hundreds to rally against new coal plant", Media Release, May 24, 2011. ↑ Alison Savage, "Protesters demonstrate against new power plant", ABC News, May 24, 2011. ↑ Patrick Durkin and Matthew Dunkley, "Vic clean coal plant left up in the air", Australian Financial Review, May 21-22, page 4. (Subscription required). ↑ "Legal action talk over power station", The Age, May 21, 2011. (This is an AAP story). ↑ Tom Arup, "Power ruling setback for EPA", The Age, March 30, 2012. ↑ Adam Morton, "HRL freezes Latrobe Valley power station plans after legal ruling", The Age, April 17, 2012. ↑ 52.0 52.1 Matthew Dunkley, "Clean coal plant sought $600m handout", Australian Financial Review, May 25, 2011. (Subscription required). ↑ "The Victorian Liberal Nationals Coalition Plan for Planning", Liberal Party of Victoria and National Party of Victoria, November 2010, page 19. ↑ "Playing favourites with Victoria's energy future", Environment Victoria, May 25, 2011. ↑ Adam Morton, "Stricter rules for wind turbines than for coal plants", The Age, May 25, 2011. Dual Gas, "Dual Gas Pty Ltd Media Statement regarding EPA Victoria’s announcement today on its decision to grant part approval for the Dual Gas Demonstration Project", Media Release, May 20, 2011. Julia Gillard, "Letter re HRL", September 26, 2011. Environment Protection Authority Victoria, Dual Gas Pty Ltd – dual gas demonstration power station, Morwell, Environment Protection Authority Victoria September 2010. Environment Protection Authority, EPA Grants Part Approval for HRL Demonstration Project", Media Release, May 20, 2011. Environment Protection Authority, "FAQ’S - HRL Dual Gas Pty Ltd Decision", Environment Protection Authority, May 20, 2011. Environment Protection Authority, "Works Approval: Dual Gas Pty Ltd", Environment Protection Authority, May 20, 2011. Environment Victoria, "New coal-fired power station makes a mockery of State Government's climate credentials", Media Release, July 2, 2008. Environment Victoria, "Coal power station rebrand is last gasp of a polluting project", Media Release, September 25, 2009. Environment Victoria, "New coal power station decision to test Brumby’s climate credentials", Media Release, August 4, 2010. Environment Victoria, "State Government should rule out new coal-fired power station", Media Release, September 14, 2010. Environment Victoria, "New coal-fired power station faces massive public opposition", Media Release, October 6, 2010. Friends of the Earth, 'FoE condemns state government's coal power station announcement", Media Release, July 2, 2008. Friends of the Earth, "Climate White Paper a Game Changer", Media Release, July 26 2010. Friends of the Earth, "The HRL coal fired power station", Friends of the Earth, August 4, 2010. Louise Morris, "Greenwashing coal", Chain Reaction, Number 104, December 2008. Mathew Murphy, "Coal comes out green - after a good spin wash", The Age, September 26, 2009. "Uncanny ability to reconstruct reality", Letters to the Editor, The Age, April 17, 2010. Adam Morton, "Green for go with brown-coal station", The Age, April 14, 2010. Adam Morton, "Proposed coal plant under fire", The Age, August 5, 2010. Adam Morton, " Proposed coal plant application withdrawn", The Age, August 5, 2010. Adam Morton, "Coal power plans lack detail on emissions, say critics", The Age, September 18, 2010. Melissa Fyfe, "New coal plant a $750m mistake, says Flannery", The Age, October 10, 2010. "Follow best practice", Letter to the editor, The Age, October 22, 2010. Greg Barber, "Cutting the carbon", The Age, February 16, 2011. "Power plant gets partial approval", The Age, May 20, 2011. "Legal action talk over power station", The Age, May 21, 2011. Tom Arup, "Coal-fired plant faces funding threat", The Age, October 10, 2011. Adam Morton, "Axe Latrobe Valley power plant grant, say Greens", The Age, September 19, 2011. Tom Arup, "Landmark power plant case begins", The Age, October 25, 2011. Darren Gray, "Council backs coal in Morwell gas power play", The Age, September 2, 2011. "Ferguson grants extension for contentious power plant project", The Age, February 10, 2012. This page was last edited on 18 May 2018, at 16:24.